at Taghreedat DC conference in July. One of the top reasons why Twitter is so popular among young generation is that it enables users to “create their own identity,” but not until recently, Arabic users will enjoy using their own searching engine to track stories and archived substances, and importantly, to bridge Arab’s aspirations and unity, thanks to a dedicated volunteer translators from Taghreedat. Twitter Arabic archiving site, which is intended to go live during this year with the help of 3,500 volunteers from 28 countries to Arabize its interface and Arabic (Storify), will become among the first three languages to be applied to the website. 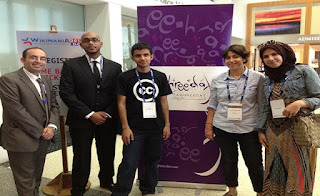 With currently over 90 Ambassadors (members) in 10 Arab countries and volunteers from 20 Arab countries, including the UAE, a relatively novel concept and an ever growing initiative, Taghreedat is aimed at building an active, vibrant and vocal Arabic e-content creation community that contributes directly and significantly to increasing the quality and quantity of Arabic e-content. The non-profit group, which was founded by Qatari-based Sami al-Mubarak and Mina Takla, is now being supported by Abu Dhabi’s twofour54 media cluster and is officially based in the UAE. “Taghreedat has always been, and continues to be, an immensely exciting and truly gratifying journey. To see our projects unfold and grow with such great pace, and to see our international and regional stakeholder network expands is something we always value and a great motivation for us to continue the work that Taghreedat has started. Twofour54’s support has grown the initiative’s scope and we will keep challenging ourselves every day as to how we could keep enriching the Arabic web, with more creative unprecedented ways,” Takla told Al Arabiya on Thursday. On the meantime, Taghreedat is working with San Francisco-based Storify CEO, Xavier Damman in a partnership to enhance the capacity of the intended Arabic version. Storify is the number one social media content archiving website in the world. It was called by the Times Magazine as one of the top 50 websites in 2011. With its grass-roots Twitter Arabization project completed in January 2012, Taghreedat is now carrying out several Arabic e-content related projects, utilizing its ever growing community of Arab volunteer translators, linguists and developers. Taghreedat, as now a twofour54-supported initiative, is working with a number of key digital content stakeholders in the region and worldwide to both execute Arabic e-content projects that increase the quality and quantity of the web’s Arabic content. In cooperation with Wikipedia Foundation, Taghreedat has launched the Arabic Wikipedia Editors Program – the first regional program which targets regular Internet users to train them (both online & offline) to become Arabic Wikipedia editors. The program has been officially kicked off to great enthusiasm from social media users. So far, there are only around 630 Arabic Wikipedia editors around the world – a relatively low figure which this program aims to change. Additionally, Taghreedat is actively engaged with the Book Shelter, an Emirati cultural initiative, to bring a lot of the Taghreedat’s community social media content to e-books for the first time. In partnership with the Book Shelter, Taghreedat will produce five Arabic digital books, based on the Taghreedat community Arabic language posts published online at: www.storify.com/taghreedat and will be distributed in universities and schools. Taghreedat is also contributing to Wikipedia’s “WikiQuote” project –which represents the largest Arabic Motivational Quotes Repository. Through this, Taghreedat will be able to contribute thousands of Arabic quotes – both originating from the Arab world and translated into Arabic, in a way to enrich the Repository which is accessible directly from the Arabic Wikipedia Interface. The importance of WikiQuote is that it creates an important cultural exchange and above all, proves that contributing to Arabic digital content can be inspiring and also fun. However, Taghreedat’s initiative is considered to be the most time-consuming yet rewarding edge. The Arab digital world currently faces a huge challenge when it comes to the absence of a unified, credible and accessible Arabic online dictionary of technology and social media terms. There has been disperse efforts in the region to come up with Arabized terms for tech/Web 2.0 terms but there hasn’t been a unified effort to bring together a solid, unified dictionary of Arabic tech terms. This project aims to create the first Arabic technology & Web 2.0 dictionary that is sourced and features several stakeholder involvements. Starting on May 31, 2011 on Twitter, as a call to action to increase the quality and quantity of Arabic e-content on Twitter, Taghreedat has successfully created a community of Arabic e-content enthusiasts from all parts of the Arab world, through its account on Twitter: The hashtag group, #letstweetinarabic, @Taghreedat, which currently has over 87,000 followers. “It’s never about the number of followers, but ultimately, how much these followers and community members are really interacting with you. We believe the true contribution that Taghreedat has been able to achieve a great community: a powerful group of translators, volunteers and enthusiasts who are capable and willing to enrich Arabic content on the web. Next, Taghreedat will embark on new platforms, including comics. Look out for that very soon,” Mubarak told Al Arabiya on Thursday. The key idea behind the initiative is to create a culture of content production rather than content consumption: through driving social media users to produce content as well as volunteer in relevant Arabic e-content projects. With English still ranking 1st in the Top Ten Languages on the Web, with over 565 million English speaking users around the world as of May 31, 2011, and Arabic ranking 7th in the Top Ten Languages on the Web (in terms of usage), Taghreedat is a much needed initiative in the region, especially that Arabic digital content is less than 2 percent of the global online content as of 2012. According to a recent Klout Study, Taghreedat’s Twitter account now ranks among the top 5 most influential Arab brands on Twitter, the study measures the Twitter influence of non-personal, organizational, corporate, governmental and non-governmental Arab accounts on Twitter, with over 350,000 re-tweets and over 60,000 mentions in the past 90 days alone. With a frequent, ongoing call to action for all Arab users to increasingly tweet in Arabic language, Taghreedat can be considered as one of the reasons why Arabic language has boomed on Twitter in 2011. The Arab spring, and the significant presence of influential Arab figures on Twitter have undoubtedly been the key contributors to such rise. Taghreedat’s efforts came to further foster the awareness on the importance of tweeting in Arabic, especially on a community level. A 2011 Semiocast study showed that Arabic is now the 8th most used language on Twitter as of October 2011. The volume of Arabic messages has multiplied by 22 (+2 146%) between October 2010 and October 2011. Arabic messages represent 1.2% of all public tweets (2.2 million per day) and in October 2011, more than 2 million public messages were posted every day on Twitter in Arabic, from about 30 000 in July 2010.